Have you ever thought about buying a home? Whether you are considering a search this spring or not planning to look for years, this informational session will help you understand the basics of buying a home in the Greater Hartford area. It will be more of a conversation than a lecture, and questions will be strongly encouraged. 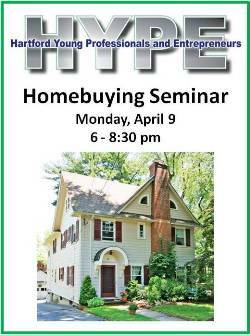 We will be leading the HYPE Homebuyer Seminar on Monday, April 9th, 2012 at 6:00pm. It will be held at the MetroHartford Alliance Board Room at 31 Pratt Street in Downtown Hartford. Registration is required, and there is a modest fee, between $5 and $10 depending on when you register. Light refreshments will be provided. – What critical steps do I need to take in order to prepare for a purchase? – Who am I likely to work with during a purchase? – What is a buyer’s agent? – Are some real estate websites better than others? – What kinds of mortgage financing and closing cost assistance is available? – How are condos different than single-family houses? For those who are not familiar with Hartford Young Professionals & Entrepreneurs (HYPE), it is a large organization based in Downtown Hartford that helps connect young professionals in the region. HYPE puts on multiple events each month, on a huge variety of topics; visit the website for more information. The next scheduled HYPE event is the monthly “Get HYPEd” happy hour on Wednesday, April 4th from 5:30 to 8:30 at Zula at 901 Main Street, Hartford. There is no registration or cost for Get HYPEd – just show up with your friends and meet other interesting people. But back to the Homebuying event … please spread the word to friends, family, co-workers and neighbors. We’ve done this sort of thing before with HYPE. Each time it’s been a lot of fun and we’ve gotten positive feedback that it’s helpful to those who attend. Monday, April 9th from 6:00 to 8:30 at the MetroHartford Alliance Board Room at 31 Pratt Street in Hartford. Here is the link to register. Thanks – hope to see you there!